The growing age of software industry has also led to the booming numbers of file formats and other kinds of storage options. These file formats are used depending on the various setups and surroundings to be considered for transferring the same or to be used as a reader or to be simply used to store important data for further processing of software applications. .word –This format is used for a text file and is used to indicate that the program used to get this file is called as Microsoft word. .mp3 – These kinds of files are used to denote that it is an audio file and can be used to store music, songs and other audio recordings. .IMG – These kinds of file are generally opened with Windows Photo Viewer which indicates that it is an image file. 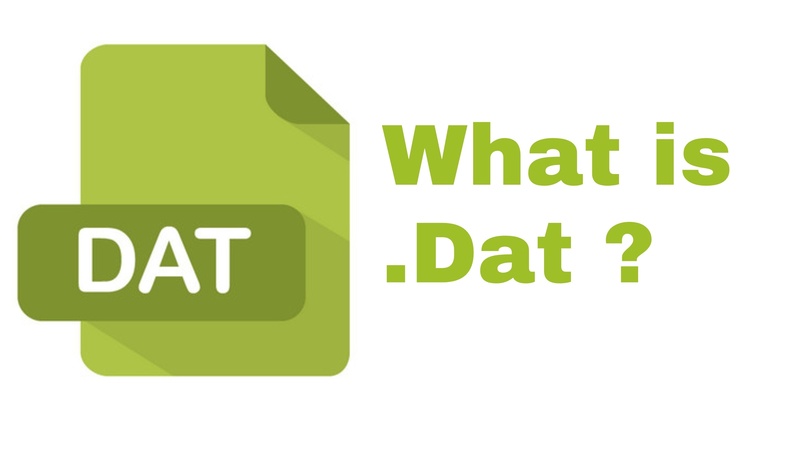 .DAT file – These kinds of file are difficult to decipher and such files are stored in the internal memory of the system when the system has no such readable application to open these kinds of files. Thus there are few kinds of files that are widely used in the present software domain. There are other kinds of file modes which are available and they are consequently used by the users depending upon the type of the operating system and the various kinds of system configuration for the device. There are various kinds of files which are stored in the internal memory of the computer or the device which the user has been using, that is stored in an unreadable format and it becomes next to impossible to decipher the content in such folders. It is also pertinent to note that, from the very beginning it also becomes difficult to note the type of the information that is stored in the file, whether in the form of audio or image or text or video. Thus .DAT file is a generic file extension which is used to store any kinds of file irrespective of the format and can be used accordingly as per the system settings. These files are not created by any specific type of software but they are inherently generated with the help of some internal applications of the system but this leads to an added advantage that it can be used to store any kinds of files. DAT files as email attachments. Thus as the data behind a DAT file is not so obvious, so the user has to do some kind of digging in order to retrieve the type of data and thus it is a time-consuming process. Thus these kinds of files are not that easy to be deciphered at once and so the easiest mode is to use an inbuilt text editor and the best text editor is Notepad which can be easily found in the internal memory of the computer. Thus generally these kinds of files are basically Adobe files and can easily be opened by Notepad to read or edit the contents. But there are also other types of files which cannot be deciphered by using a text editor and these are generally the configuration files of any software which cannot be read or converted manually by using a text editor. Thus these kinds of text files in.DAT format cannot be read or opened. These kinds of the file consist of video contents and when opened in the internal domain of the computer, it appears to be unreadable or in the form of computer codes which are only understandable to a coder. Thus these kinds of files can only be opened if it has been linked to some internal programs which are used to open such files. Thus such kinds of files can only be read with the help of some saved applications of software on the computer. These kinds of files are generally received in a mail inbox as a malformed attachment and are generally received from outsources called Microsoft Email Clients such as Outlook, Outlook Express, Windows Live Mail and Microsoft Exchange. These types of files generally come in the form of winmail.dat or ATT0001.dat file. They can be imported and then further uploaded in the Winmail Opener to check the contents of the file but eventually, they turn out to be either a text file or an image file. Some types of DAT files are used in the backend in order to store various types of data and is generally used as a backup program to store various kinds of information in a single format of DAT file. Thus such kinds of programs are used and implemented only by specific programs and it can only be read in the internal memory with the help of an XML File. These kinds of files are generally unreadable by any other program and after opening this file a few gibberish languages is visible to the user. There is no set pattern as to the specific method to convert a file of this format. As per the above-mentioned steps, the opening and conversion of a file of this format depend on the contents of the file and it thus requires a certain amount of hit and trial and different permutation and the combination of various software to be able to open a file of this format into a readable file format. Thus there is no such particular setting to store this kind of file as it is being used and configured by different software into their required readable format. This makes the user perplexed and thus it becomes necessary for the user to advocate the hit and trial method in order to decipher the contents of the file and then use the necessary software to read or retrieve the contents of the file. This is the newest form of software which has been introduced in the market in order to simplify the task of the user and avoid the use of various hit and trial modes and text editors in order to note the contents of the file. Thus it is an open source software which can be downloaded and used for free of cost and thus it can be downloaded from here. Thus, these kinds of .DAT file is the files which are generally treated as junk files for any first time user but these files contain essential information and data about the system configurations or details regarding important text and video documents. Thus the appropriate and necessary conversion of these files into readable format is necessary for the system to run smoothly and the user can also be relaxed without having any worries relating to loss of data.